U.S. 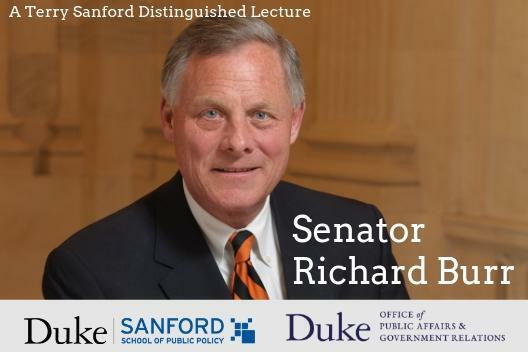 Senator Richard Burr will deliver the Terry Sanford Distinguished Lecture at the Sanford School on April 1, 2019. He will be interviewed in a fireside chat format by Deondra Rose, assistant professor of political science and public policy. There will be an audience Q&A. Burr is serving his third term in the U.S. Senate where he serves as chair of the U.S. Senate Select Committee on Intelligence, the Senate committee charged with investigating Russian interference in the 2016 presidential election. He also serves on the Senate Committee on Finance and the Senate Committee on Health, Education, Labor, and Pensions. First elected to the U.S. House of Representatives in 1994, Burr has a long career in public service where he has been a vocal advocate for the U.S. military and veterans. Prior to his career in public service, he spent 17 years in business with Carswell Distributing, a wholesale commercial products company, and is a graduate of Wake Forest University. Event updates and more information can be found at sanford.duke.edu.